I recently had the chance to attend Valve’s Steam VR Developer Showcase and had a great time trying out a dozen VR demos (you can read about the games here). It was the first developer-focused event that I've attended that showed a wide assortment of games that used Valve/HTC’s room-scale technology (i.e., the ability to walk around) coupled with tracked VR controllers. While I think that the Xbox controller has its place in VR experiences, I have to admit that it was hard for me to go back to using a controller after playing around with the Vive’s setup. It got me thinking a lot about the current state of VR input and where it’s headed. 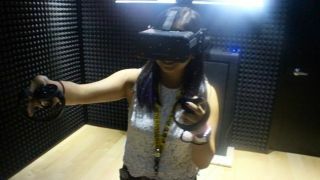 As you can imagine, trying to figure out how to get your hands and body into virtual reality is no easy task. With that in mind, I thought it would be interesting to use all the business cards I gathered at the event to reach out to the developers who were also there, to get their input on a wide range of VR input-related questions. PC Gamer's Wes Fenlon tries out Oculus with its Touch controllers. I sent out a list of questions to the developers I'd met at the event. Each of the people who answered my questions did so independently of each other, and only took on questions that they felt they were equipped to answer. In the Q&A below, you’ll get to read their thoughts on both the Vive and Oculus Touch motion controllers, how they feel about Oculus shipping initially with an Xbox controller, their ideas regarding the best VR input, and more. Maximum PC: What do you guys think of the Vive controllers? What are the pros and cons of the input? If you could change the controller in any way, what ways would it be? Alex Knoll (Stress Level Zero, Hover Junkers): The Vive controllers present a fantastic approach to input for the new medium. Very simple and very versatile, they can be used in really interesting ways, design-wise. Hover Junkers is a multiplayer-focused VR FPS. Dylan Fitterer (Audioshield): The Vive controllers are amazingly precise and shaped to fit many game styles. They've made a whole new class of games possible. I haven't put much thought into changing them, though. I tend to look at hardware as an unchangeable baseline to work with creatively; a constraint. Audioshield is sort of like Audiosurf meets dodgeball meets Ikaruga. Richard Stitselaar (Vertigo Games, Arizona Sunshine): We like the way the Vive controllers feel in hand; input and control layout work well. A docking station for recharging would be nice to have. Joachim Holmér (Neat Corporation, Budget Cuts): They're good! The touchpad is hard to explain, and the grip is tricky to explain, but I think those things will come in time once people get used to them. Otherwise, the general feel of them is great. Tracking is great. The trigger is great. I think the one thing I would like is an additional button above the touchpad, since there are very few buttons that the user won't press by accident during gameplay. Denny Unger (Cloudhead Games, The Gallery): First of all, I'd just like to say that as a studio we feel incredibly lucky to have any sort of motion control at all, especially solutions so deeply supported by key headset makers. For a long time, it was unclear as to whether or not any of the major players would support any kind of motion control solution. Having designed our game for a motion control experience since early 2013, this is really a dream come true for us. The Vive controllers are sturdy as hell. They feel like they can take a serious beating and keep on chugging along. The forward weighting is actually really interesting as it makes many interactions feel much more tangible, less like you are holding nothing. The trackpad is super extensible and devs will use it in really creative, blended ways with gestural input. In many ways, the biggest strength of the Vive controllers (aside from rock-solid tracking in 360) is their simplicity. We're finding that the less buttons you use in VR, the better the experience is and the less the user fumbles. The form factor could be improved in future iterations to provide a more natural resting point for the thumb. The grip button is great but could use some iteration on the most natural placement and sense of travel. The Vive's VR controllers offer super accurate 1:1 tracking. Justin Liebregts (Co-founder of Futuretown, Cloudlands: VR Minigolf, Jeeboman): I really like the controllers personally. They've come a long way since the previous iterations. Getting used to designing a game with so few input buttons was a big challenge. I'm very happy that the controller is so simple, but from a developer perspective, it's been pretty interesting having to go back to the drawing board to rethink some of the methods of input. When your game is forced to only have 3-4 buttons, it really makes you think about the purpose you're using each button for, and to make every button on the controller count. In some games it's a nonissue. But for more complex interactions, it becomes an interesting challenge. I've been having a lot of trouble figuring out great ways to integrate the touchpad into our game as a touch device (not as a button press). We found that pulling up a radial menu in front of the user, instead of using the touchpad as a radial menu directly, felt better for our purposes (check out the Weapon select wheel on Jeeboman). There's also interesting issues with people pressing buttons by accident because they are clutching the controller if they are swinging it. If I could change the controller, I might move the grip button to a button underneath the trigger. It’s hard to tell without prototyping a new controller though. The back of a Vive controller. Notice that there's a trigger button and two side grip buttons. Andy Moore (Radial Games, Fantastic Contraptions): The Vive controllers are pretty great, but it's hard to make comparisons or criticize them - other than the Oculus Touch controllers, there's no alternative that hits the same points. They've got incredibly accurate 1:1 tracking in the space, they've got no occlusion problems, and I can do anything I want with them shy of sticking it up my shirt. I do want to make a point here - about Availability Bias. Our knee-jerk reaction to a new technology like room-scale VR is going to be, "Let's take all the hits from last year, and port them to VR!" - we already see this a lot from fans, begging for a Call of Duty, Battlefield, or even Mirror's Edge port. Now, I'm a huge Mirror's Edge fan, but it may be the worst game to port to room-scale VR. Fantastic Contraptions has you building with your hands and is sort of Poly Bridge meets a Rube Goldberg machine. As fans call for these demands, they expect to see things like thumbsticks, and A/B buttons on each controller. No. Bad. Shush. Remember when iPhones first came out? Virtual D-Pad games were all you could find. Why? Not because it's the best possible solution for the mobile interface, that's for sure. It's because developers and gamers just set down their controllers and picked up their phone and wanted something familiar. I'm not at all interested in providing something familiar; I want to jump to the end, and help produce something that will be the de facto standard for all VR games to come. For that purpose, the VR controller, as it is, is pretty perfect. Of course, I can nitpick a bit, but it's totally unfair - the current batch of controllers are nowhere near final. The system but could be moved to prevent accidental presses; people don't realize there are grip buttons; etc... But I'm confident they'll be pretty solid controllers by launch. Maximum PC: What do you guys think of the Oculus Touch controllers? What are the pros and cons of the input? If you could change the controller in any way, what ways would it be? Denny Unger (Cloudhead Games, The Gallery): The Touch controllers have a great sense of balance. The Carbon teams' experience with Xbox controller design really shows here. They have a natural resting point that feels great and it's easy to forget they are in your hands. The grip button has a really nice sense of travel, and the trigger has just the right amount of tackiness to make it feel anchored. The finger gestures are neat and hopefully devs find interesting uses for them. There is a sense of fragility and lightness which may or may not help with the perceived tangibility of interactions. The button and stick design feels a bit like a bridging mechanism to bring old-school games into the VR ecosystem, which makes sense on paper, but feels a bit weird in some VR experiences. Like all VR input at this early stage, some of the design choices feel like a half step to something better. Joachim Holmér (Neat Corporation, Budget Cuts): We've yet to use them, so I can't really give a balanced opinion! They seem to aim for a more ergonomic approach, where each controller is made for either the left or the right hand, which is pretty cool. The touch interactions are interesting too, especially for the social aspects of VR and its games. The Oculus Touch controllers also offer super accurate 1:1 tracking along with joysticks, triggers, and traditional gamepad-style buttons. Richard Stitselaar (Vertigo Games, Arizona Sunshine): The Touch controllers are great, using hand gestures in VR feels natural, and the analog stick is familiar. Docking station would again be a great addition to the controller. Andy Moore (Radial Games, Fantastic Contraptions): I've had a chance to try the Oculus Touch controllers and I have to say they're pretty technically comparable to the Vive controllers. They've added some neat features that I really want to try developing for. I have two main thoughts on the Oculus controllers that make me worry, but maybe for the wrong reasons. They're a bit philosophical. First, they have the thumbsticks and A/B buttons. On one hand, this is not optimal for a room-scale VR experience - and in encourages porting of games that would otherwise be a poor fit. However, Oculus is not particularly aiming for a room-scale audience, and having a larger back-catalog of games available at launch may indeed be better for the ecosystem as a whole. I'm not sure what to make of that. They've got some smart people over there, and I'm sure this was a hard decision for them. Secondly, the controllers are shaped almost exactly like pistol grips. This is GREAT news for most games and gamers out there, and again is probably a very smart move to capture a good audience. However, at Radial Games, we're trying to make games that don't have guns specifically. I wonder how many games may subconsciously be developed to have guns because "that feels the best" when you hold the Touch controllers, or if Oculus will just have more "gun games" in general because it feels better than, say, the Vive. Again, I'm sure the folks at Oculus ran the numbers and figured this was the better path. I think I just lean in a different direction, philosophically. I don't have a team of market analysts at my disposal and I could totally be wrong on both these points though. One of the most exciting things about the last few years, and the year ahead, is that we're figuring all this stuff out for the first time. I'm super excited to see where we go from here! Maximum PC: What do you guys think of Oculus shipping with an Xbox One controller as the baseline controller for their VR system instead of their Touch controllers? Are you worried about input fragmentation at all? Joachim Holmér (Neat Corporation, Budget Cuts): It's a strange decision, but it somewhat makes sense for their focus on seated experiences. There is a worry that it will promote using locomotion systems, causing nausea, which is not a good thing for VR as a whole. And yes, we're worried about input fragmentation, but we're just guessing at this point. Hopefully it won't be an issue! The Oculus Rift will ship with a wireless Xbox One controller. Justin Liebregts (Co-founder of Futuretown, Cloudlands: VR Minigolf, Jeeboman): I think it was probably a pretty tough business decision from their side. I can understand why they have chosen to move forward first with the Xbox One controller and I feel their top priority is probably going to be getting those Touch controllers out as quickly as possible, so I'm not too worried about it. We will be supporting Touch controllers and we believe that users will find the tracked controller experience so compelling that they will opt in for the Touch controllers when they're released. Yes, we were a bit worried originally about input fragmentation, but I think the Touch controller is so much better tech than the Kinect (as an example of a failed input device), so I'm not too worried. Cloudlands VR Minigold really feels like you're playing minigolf with one of the Vive's controllers. Denny Unger (Cloudhead Games, The Gallery): Since early 2013, we've been designing for motion control, and we've fought hard to keep that paradigm at the core of the experience. So we're a bit biased on this topic. Can you play VR games with a gamepad? Yes. Should you? After experiencing rock-solid motion control, it's really hard to go back to a gamepad. Done properly, motion control adds an entirely new level of immersion and interaction within the VR experience. It feels like "the way to do things in VR" in a very visceral way. Is there room for a standard gamepad in VR? Sure, but I can see that paradigm quickly shifting to motion control once the public understands how much better the potential experience is. Any fragmentation will be short lived once the public drives that dialog. Richard Stitselaar (Vertigo Games, Arizona Sunshine): We think that most Oculus users will migrate to the Touch controllers because of its more natural and intuitive feel. While there will always be games and players that prefer an Xbox style controller, the quality of experiences possible with Touch will pull most players and developers away from gamepads for the Rift. Andy Moore (Radial Games, Fantastic Contraptions): There's a certain magic you feel when you have tracked controllers in a VR space, and I'm personally not so interested in games that use standard controllers in VR anymore. I'm very excited about the Touch launch, and hopefully that coincides with the timing of mass-market appeal of VR devices (initial launch will be a slow ramp up of early adopters, so if you're EVER going to ship with non-tracked controllers, that's the time to do it). Maximum PC: Do you guys plan on shipping any VR games with the Xbox controller in mind? Why or why not? Dylan Fitterer (Audioshield): Audiosurf 2 will support VR with a free update and it'll be playable with a gamepad, mouse, keyboard, or motion controls. Sitting or standing. Richard Stitselaar (Vertigo Games, Arizona Sunshine): Yes, we have some games that we plan to make playable for Gear VR, and PSVR requires the ability to play games with a gamepad. This will require us to release with gamepads in mind. More broadly, our preference is for motion controllers, as they significantly increase the sense of presence and open up new types of gameplay mechanics that we find more immersive, which is key for VR. Joachim Holmér (Neat Corporation, Budget Cuts): Not at the moment. Being able to see your controller in VR is very important for new players, especially those who aren't used to playing games. Budget Cuts is one part stealth game and one part Portal. Alex Knoll (Stress Level Zero, Hover Junkers): We find VR with tracked controllers the most interesting to design for and also the most fun to play, we do not currently have plans to create any VR experience without tracked controllers. Denny Unger (Cloudhead Games, The Gallery): No. There are simply too many incredible, exciting, revolutionary, paradigm-shattering, and novel ways to use motion control in VR. We're just excited to experiment with the possibilities. Justin Liebregts (Co-founder of Futuretown, Cloudlands: VR Minigolf, Jeeboman): No plans at this point in time. Our studio is focusing on tracked controller input experiences as we want to go all-in with what we feel is the most rich VR experience on the market. The leap between a normal PC/Console game to a VR headset with a traditional controller is small compared to the leap between PC/Console gaming and tracked controller gameplay. Games that can exist on one input device, cannot exist on another. And the best games for the Vive and Oculus Touch will be those that don't sacrifice themselves to support both play styles. I believe none of the games at the Vive Developer Showcase would be as amazing as they are without tracked controllers. Dirk Van Welden (Founder of I-Illusions, Space Pirate Trainer): In VR, immersion gets stronger as more senses are used. I can totally see how an Xbox controller can be useful for seated experiences where you would otherwise need a steering wheel or joystick (Flight/racing simulators/controlling devices) or non-first person experiences (but those could be less immersive). The problem is that with most of those, you get motion sickness as you are not introducing all the movement by yourself. When I tried the first DK1, I immediately knew that this would be a huge deal breaker for a lot of people. Once you get motion sick, you really don't want to put the headset on again. Space Pirate Trainer has you blasting droids like Boba Fett. For non-seated first-person experiences in VR, which are more immersive, VR controllers have a huge advantage over gamepads. I can't see a lot of the Steam VR Developer Showcase demo's [playable at Valve’s event] working without them... Doing actual physical interaction with the world is much more immersive. It's unexplainable, but once you hold the VR controllers, it just feels so right. Once you play a VR game that is built around this controller, you immediately understand the fun and importance of it. It's all about interaction, so why wouldn't we use the best way to interact with the VR world? Andy Moore (Radial Games, Fantastic Contraptions): We are working on a few prototypes and exploring new technologies as they present themselves. One that is promising does indeed use a standard controller, but not used by the player within VR (think two players, one in VR, one out, same room). I'm cool with that, but I don't think we'll ever ship a game that uses a standard controller within VR itself. The video above outlines the changes to the Vive Pre since its first developer kit. It's great for people that know the tech - if you're an avid XBox or PS4 player, it'll be no problem and comfortable. It's just that our studio in particular is focused on more accessible games.